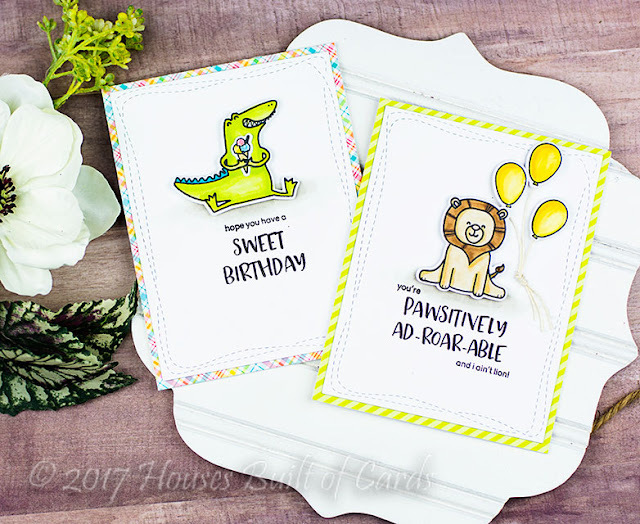 Houses Built of Cards: Heffy Doodle Blog Hop! Good morning! 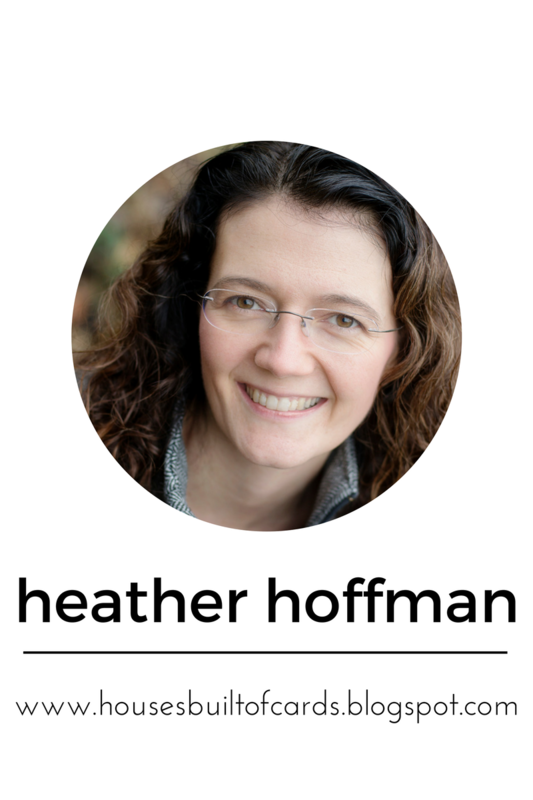 Super excited this morning to be joining in a fun and fabulous blog hop to celebrate a BRAND NEW company called Heffy Doodle! I met Lesley at CHA in January and was delighted when she contacted me about playing with some of the new goodies and helping promote the launch of her new company. Her Kickstarter was fully funded in under half an hour - and is now funded more than 20 times over! So excited for her - and obviously everyone else was as well! you can check out the Kickstarter HERE if you want to get a great deal on a pre-order of the new stamps! Make sure and leave a comment before you leave - a winner will be selected to win a Heffy Doodle cotton tote and a set of 12 Distress Oxide inks! Woohoo!!! 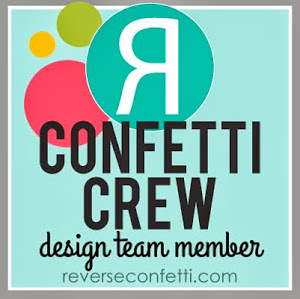 Comments must be left by 4 AM July 20th - winner will be announced on the Heffy Doodle Blog on July 22nd. I colored up the adorable images with Copic markers and die cut with the coordinating dies. I also used Copics to add a shadow under the critters before mounting them with foam adhesive over the darling sentiments! I added some twine to the bottom of the balloons on this one, and (hard to see in the photos!) covered them with a thick layer of Glossy Accents. 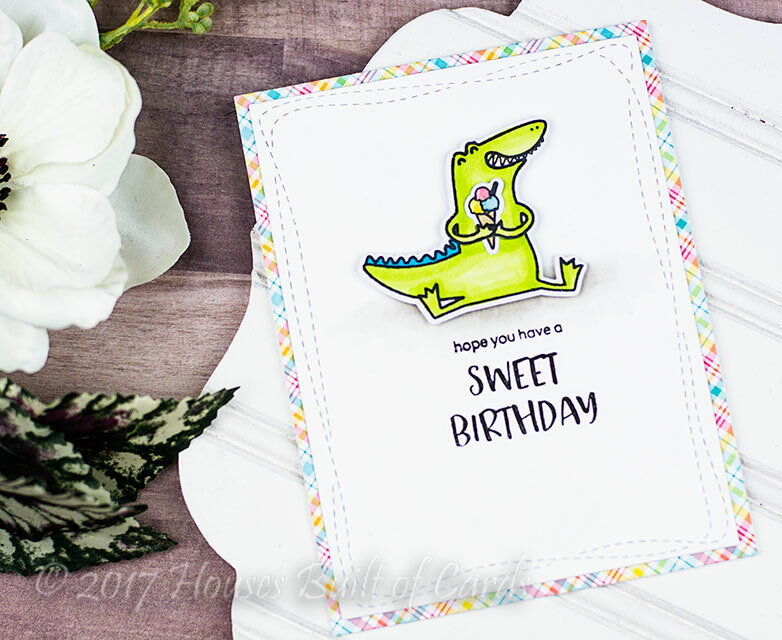 I LOVE one little feature of this darling little alligator - the dies cut the hands so that you can slip one of the cute little stamp set additions into it! So I slipped a triple scoop ice cream cone in there on this one! Both cards I die cut the front panel with a SSS die, and added some pattern paper from some Lawn Fawn 6x6 paper pads. Aww, just beautiful images! Love the CAS look with the wonky stitched lines and the patterned paper peeking through from behind. Very cute. I like your coloring. I will go check out this new stamp company's blog. This crocodile is simply the cutest!! I LOVE the alligator's hands!!! Just think of all the possibilities!!! Love the croc holding the icecream cone ! He's so fun ! Love the cards you made ... they feel very cheery. Heather, your cards are so adorable and sweet. Anyone would love receiving these cute critters! Lovely cards... simple but super cute. Love the colors on your adorable cards! Just love the crocodiles smile, he kills me! 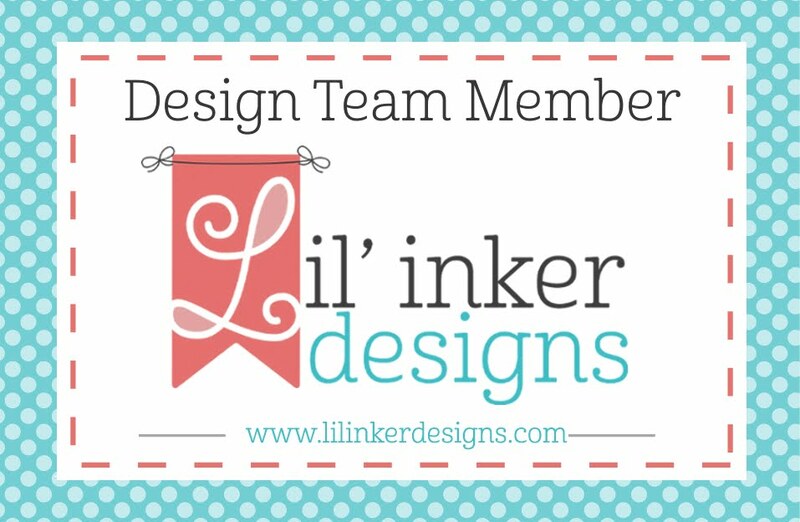 Lol- you make great cards, nice colors and coordinating patterned paper! These cards are so sweet. Love the simplicity of them! Your cards are amazing. Bright and cheerful. They truly allow the sweet images to be a focal point. Thanks for the inspiration using the new Heffy Doodle images! So cute and they look like they would be easy to make! I really like the bright and cheery colors of your cards. The puns that go along with each set makes me smile! Oh my cards!!! Your cards are so cute and sweet!!!! I think the crocodiles might be my favorite, but I keep changing my mind! They are all so "want-able!" Thanks for your card examples. I love the bright colors! super cool cards! Clean and cute card! The sentiment on the lion card is so funny, haha! Cute darling cards. Love these images. Your cards and colors are awesome. These critters are so cute and I love your happy papers! so cute! great coloring, they are bright and cheery! I love the clean and simple look, so nice! simple and sweet fabulous cards. I am glad I joined the kickstarter for this company. I see a fantastic future of great images from them. Great Copic work! And these images just make me smile. These cards have an addicting smile. So sweet and cheerful! What a darling couple of cards! Such cute stamps to work with. Friday night live crafting with Lesley on YouTube is so fun. How lucky to get to work with them before they are released! Very Sweet and simple....my favorite kind of card. Thanks! Love the roar pun. That lion is the cutest. I love the croc can hold stuff! Darling. Thanks. I love the simplicity of these cards. They are so cute. Lovely cards; the recipients will be ecstatic. Love your coloring of these sweet critters! The croc makes me laugh! So cute! 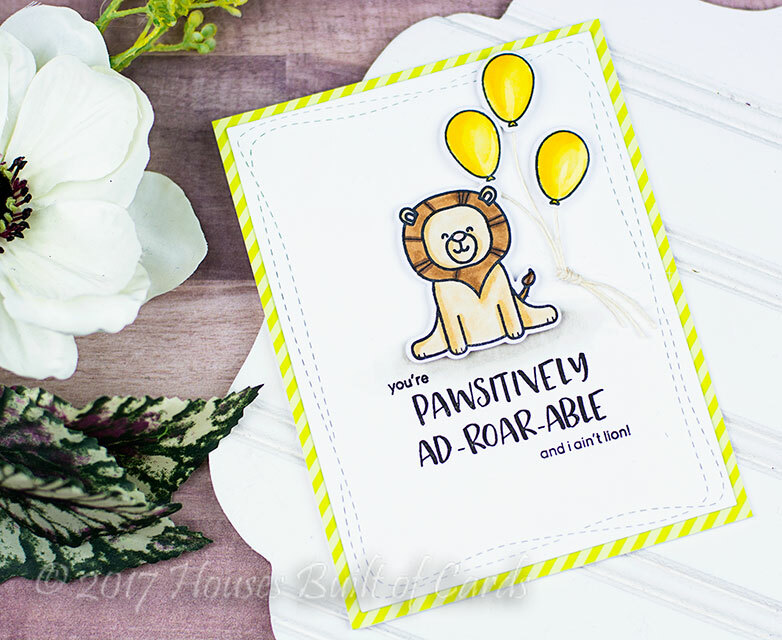 Love your Gater and Lion cards. The stamp sets are fabulous. Super cute cards, and I am such a big fan of punny sentiments! Love these! Love the stamps and cards! The croc is cute! Love these images, Heffy Doodle rocks. Great cards! Cute cards! I love the sentiments! Wow! These cards are off the adorable chart because they are so cool! TFS! Great cards, and special thanks for listing all the marker colors! Super adorable cards ! Thanks for sharing ! Sweet! That gator just makes me giggle!! Cute cards! This release is so much fun. Thank you for sharing. What a great blog hop and incredible gift prize. Oh Heather, your cards are just sweet. As much as I love the croc's and lions, I love the cute sentiments. You have paired them well! Lovely cards there! Loved all of them. Thank you for sharing with us! OMG that alligator, he's just too cute ! Two simple but sweet cards. I love the elephant set. I hope this company does well. I love the colors used on these cards! This croc is so funny! Very cute cards. Love the simplicity. so cute...makes me smile...can't wait to get my stamps!!! I love the sentiments that come with these stamps! I love clean and simple cards like these. Adoreable! So adorable!! Beautifully done. Thank you for sharing your talent. Love the way these turned out. So cute. Thanks for sharing. I love the cards, so cute! Great cards and great stamps! What a happy croc with his ice cream. I like that these cards could be given to any gender. Awesome cards, I especially love the sweet lion! I love learning about the NEW stamp company, Heffy Doodle! Such adorable and happy cards! Love the vibrant colours of the critters too! Very clean and beautiful cards. Thank you. These are so bright and happy! I love them! These bright colors look so cool with these stamps!! Such a sweet new brand!!! Love your adorable cards!!! Really sweet cards. The bright colours are great. Such bright and cheerful cards. These cards are so beautiful, sweet, and adorable! The little bit of bright color peeking around the edges really draws attention to the stamps! Thank you so so much for sharing! Just my style of card. These are amazing and so cute. Wonderful clean look with the great use of the image in the center. Your cards are "paws-ingly" cute! Your cards are so cute, love them. Great stamps.